This article deals with the issues that arise when a Point-of-Purchase(POP) plan is designed for a newly launched brand of consumer goods (Deodorants in this case). In a low-involvement product category like deodorants, it is important to break the clutter in terms of the product design, packaging and promotions. Since low-involvement leads to impulse purchase behaviour in consumers, the design of in-store merchandise, the store environment and other components of Point-of-Purchase become crucial. Since, deodorants are products inspired from the western world, it is important for a marketer to discern the cultural differences in the Indian society in the last-mile implementation. After studying the market trends in the deodorant segment, the competitive brands in the market are studied to understand their positioning. 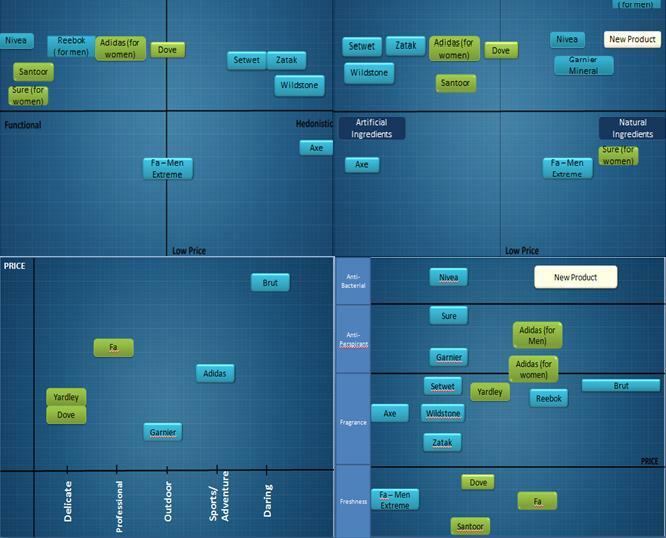 Based on this perceptual maps have been developed and the gaps in the market have been identified. Based on these gaps, product features have been designed. This led to the identification of the issues related to design of Point-of-Purchase plans. The issues were identified after analyzing the various steps involved in the life-cycle of a brand. The first stage is to craft a unique and differentiable positioning for the brand and to launch the brand. Given the characteristics of the deodorant industry, the in-store promotions and the point-of purchase plans in both kirana stores and modern retail have to be carefully designed keeping in mind the psychology of the target segment. The deodorant industry in India has seen a sales growth of 40% in the year 2010 with a market value of INR 8 billion. The year 2010 had seen innovation in the ingredients used in the deodorants as there has been emphasis on the usage of natural and herbal ingredients. Companies have been using high profile advertising campaigns to increase their market share as deodorants are a highly under penetrated category. Though the organized market is concentrated in the major cities the recent years have seen more consumers from satellite towns and cities entering the category. It is noticed that chained supermarkets/hypermarkets have been particularly important in driving this category. As competition kept prices in check, companies focused more on growing the market in volume terms rather than raising margins. Premium deodorants accounted for less than 2% of value in 2010, reflecting the fact that deodorants are a daily use product. Premium deodorants are generally extensions of premium fragrance brand, with distribution largely confined to upmarket department stores. Impulse buying behavior constitutes 70% of deodorant purchases in India. Both multinational and domestic companies have a strong presence in deodorants. Domestic companies improved their position in the latter part of the review period through the launch of a number of new deodorant products. They were able to steal some share from multinational companies due to aggressive promotion as well as leveraging the increased presence of chained modern grocery retailers, such as supermarkets/hypermarkets, in smaller cities across India. 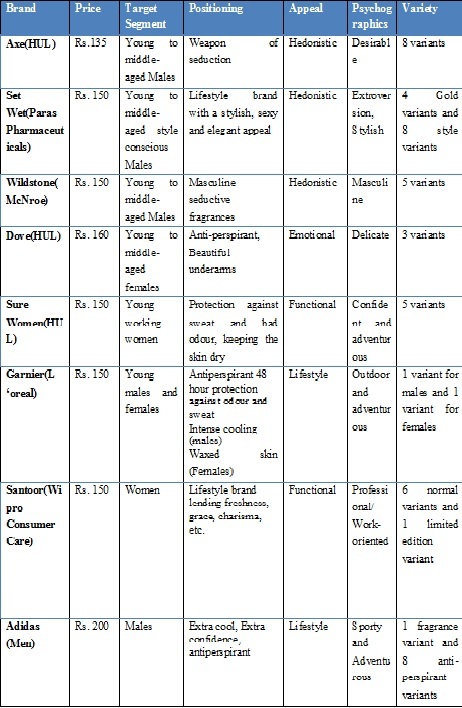 Based on the market information as shown in Exhibit 1, perceptual maps (Exhibit 2) of the brands have been constructed by evaluating price against functional/hedonistic appeal, attributes and psychographics. The male deodorant sub-category is heavily cluttered with products communicated on hedonistic appeal. The hedonistic appeal used by most popular male brands is incongruent with the Indian milieu and modes. Benefits like health (anti-bacterial) are hardly addressed through the products currently in the market. The new deodorant will be priced from Rs.200/-, has anti-bacterial benefits, made from natural extracts, targeted towards the Males, have a value proposition of �Be an achiever in Life and enjoy protection from odour-causing bacteria� and should promote Achievement appeal through Modern Retail and Aspiration appeal through Kirana stores. With these product features mentioned above, three issues were identified in the design of the POP plan for the new deodorant product in the modern retail and kirana store outlets. This issue deals with the existence of clutter in the male deodorants with reference to hedonistic appeal, which is incongruent with the Indian cultural context. It has also been found that the recent economic downturn has created a new �normal environment� with dramatic changes in shopper behavior with shoppers cutting back on hedonic spending.However, these deodorants have done well in the market because of the novelty of such appeals at the time of their launch. Our new brand has to break this stereotype and emerge with a differentiated appeal. However, since the proposed positioning is not in sync with the existing perception of the product category, the issue is to design the POPs such that the consumer perceives the category membership clearly. Modern Retail: With an �achievement appeal�, the product can be positioned differently in the market at a reasonable price. This appeal is in sync with the psychographic characteristics of the modern retail shoppers in India. Moreover the core benefit of the product is designed to be �anti-bacterial� which stresses the health benefits and hence makes use of contrast in its value proposition. The POP material must be designed to convey the achievement appeal as the figure and anti-bacterial and natural extracts attribute as the ground. Kirana: The same product, which is competitively priced to be sold through kirana stores as well, can be communicated with an �aspiration� appeal. The demographic of the shoppers at the kirana stores is largely different in urban India from those who shop in modern retail stores, despite certain overlaps. These people have an ideal self-image of achievement. They would want to adopt products that help them experience the lifestyle of �achievers�. Hence the POP design should convey the aspiration appeal very boldly as the figure and the health benefit like anti-bacterial effects as the ground. This issue deals with in-store design to encourage impulse buying and switching behavior. This can be done through sensory simulation to gain the attention of the consumers towards the brand. The challenge is rooted in the diverse nature of the stores in the modern retail. With the development of modern retail, shopper marketing is gaining importance and is this adds to the complexity. There are a multitude of aspects like colour, theme, fragrance etc. to a modern retail upon which the contrast could be established. Also, the manner in which the contrast effect can be used varies across different stores with the ambience and format. The issue is to design POPs that minimizes the functional and social risk prior to the trial. Modern Retail: The concept of a store within a store is an example of shopper-centric store layout and design. The shopper�s attention can be drawn towards the brand through aisle placement, shelf-space positioning and displays. But most importantly, the sensory organs of the consumers must be challenged to draw attention because consumers respond to sensory cues.This could be through contrasting colour themes used for the �store within the store�, so that when the consumer rolls his eye round the entire store, this colour theme catches his attention through visual dissonance. More importantly, the olfactory senses of the consumers can be targeted by creating a unique ambience of pleasant odour/smell around the store within the store. Due to the high levels of informational influence present in the individualistic consumers of supermarket, the technology based advertising methods like mobile, RFID and e-mail advertising can help break through consumer�s perceptual blocking and move into his consideration set. Kirana: The concept of store within the store cannot be used in kirana stores. In the kirana stores, aisle placement and shelf-space dominance assume important roles as potential POPs.POP design aspects boil down to how cluttered the shelf is, how many competitive brands are on the same shelf, how easily accessible the shelf is visually, etc. The displays will tend to have a profound effect on shopper decisions in kirana stores. Contrast with other brands can be built through visually attractive bill-boards and displays of the brand in the kirana store. Also, the issue of retailer-manufacturer relationship is important in this over-the-counter type format, as the retailer becomes an important source of information for the consumer. It logically follows that success of a brand in a kirana store depends heavily on the desire of the retailer to promote the brand. And due to the value expressive social influence of collectivistic consumers in this format, technology based communications methods might not be a major influence. This issue deals with the impact of culture on the buying behavior of consumers. The cultural manifestations are different in different retail store types while indulging in impulse purchases. Modern Retail: The cultural influences in a modern retail store are analogous to an individualistic culture. According to the journal, consumers form individualist cultures are likely to be more susceptible to informational influence.Individuals self-concept is not defined by their relationships with significant others.In a modern retail store, a shopper does not know anybody, hence social atmospheric influences on his behavior are absent. Therefore his decision to go with the new deodorant brand will depend on his knowledge and awareness of the brand (intrinsic cues). Hence POPs will play a significant role. Kirana: The cultural influences in a kirana store are analogous to that of a collectivistic culture. The POP design in such a case is very interesting because, of all the information available within the store, personal sources are perceived to be more credible than marketer driven POP information.Normative social influences influence consumers� purchase intentions in collectivist cultures.In a kirana store, the shopper is in constant connect with his natural environment. He possibly has a relationship with the retailer. He may even indulge in purchases in the presence of his neighbours. Such a social atmosphere influences his behavior because such people serve as relevant others who he believes have certain expectations from him. His behavior will be shaped to not disrupt that expectation. This study provides an understanding of the importance of buyer behaviour in the Indian context with respect to retail format evolution, with a focus on the influence of Point-of-purchase material for a newly launched brand. This study also gives a perspective on how the psychology of consumer from different cultural backgrounds influences the purchase decision making of a new brand in a low-involvement category like deodorants. The student contributors would like to thank Dr. S. Ramesh Kumar ,Professor in the Marketing Department of Indian Institute of Management, Bangalore, for his guidance in their work. He can be reached at rkumar@iimb.ernet.in. Harshvardhan Singh Chauhan,Set Wet Zatak deodorant - Ready for a more sexier frontal attack, http://www.thump.in/ad-was-ad-review/set-wet-zatak-deodorant-ready-more-sexier-frontal-attack-1,Last accessed on 14th September 2012. Sai Krishna,Deodorants and the launch of �Sure�, http://brandalyzer.wordpress.com/2011/08/20/deodorants-and-the-launch-of-sure,Last accessed on 14th September 2012.